The two charts above show some interesting snapshots- the first looks at when users of Read It Later “save” their articles and the second shows when their iPad user base are reading the articles. While many might think reading is going the way of the Dodo, some recent data suggests that tablets and phones might be the devices we are now spending our time reading with. 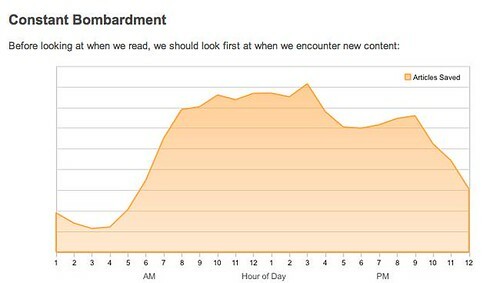 What’s coming up in the data from Read It Later is that people are constantly headline reading and saving articles throughout the day to consume later on in their personal time. This also suggests that long-form content still has a role because people are using their devices to enjoy the reading experience in their own comfort zone. Publishers should be think smartly about this two modes. 1. How do you serve up smart headlines that can convey critical information? 1. How do you create and craft relevant content for these very different modes? 2. How could you work with publishers to offer exclusive long-form content for readers? Amazing: a design competition with a real brief! !